Oakmore Builders in Bromley | Extend your home, expand your freedom. Our knowledge, vision, and expertise as builders in Bromley see us towering over our competitors at an unbeatable value to the client. That’s why we are Bromley’s No.1 builder. 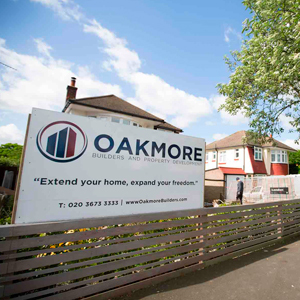 The iconic red, white and blue Oakmore logo is proudly presented on all of our Home Extension projects in and around South East London demonstrating our transparency, honest price’s and integrity. We are recognised as the No.1 home extension builders in Bromley with 90% of our work accounting for kitchen extensions and following market trend. We also offer a 10 year builders guarantee on all home extensions. As a complete service, we additionally offer full architectural plans along with premium construction on behalf of our clients in this area making your whole building process as simple and stress free as possible from start to finish. Green issues and the local environment are our deepest concerns. We advise and install up to date energy saving materials on all of our projects, and keep in strict accordance with British standards and local building control. As associates, Oakmore Builders can offer an exclusive deal from all major suppliers listed below. Complete our enquiry form or call us to request an appointment. We will arrange a time to visit you and discuss your requirements in detail. If you have architectural plans we will work through these with you, if not we can advise you and arrange for plans to be drawn up. We will email or post a full proposal to you outlining the full costs and schedule. There are no hidden costs at any time. From start to finish Oakmore Builders were fantastic. They designed, created and built our beautiful home in less than 18 months, on time and budget. Extremely happy. We are both creative professionals and certainly know how hard it is to find creative builders with passion. Oakmore Builders blew us away with their ideas and creative input. Reliable, clean, professional and hard working are just a few words that sum up our experience with Oakmore Builders. We are overwhelmed at how beautiful they made our grade two listed Victorian mansion house look after refurbishment. Having a huge kitchen space, we really needed a special kitchen. Oakmore Builders designed and imported a bespoke Schiffini kitchen from Italy and fitted the whole thing in just 3 weeks, adding a massive £75k to our property!! 5 star recommendation. Thanks for this. We can’t speak highly enough of you guys and the work that has been done. We’re really happy and we think you’ve done a great job. Thanks again.